LEROY POPE WALKER. 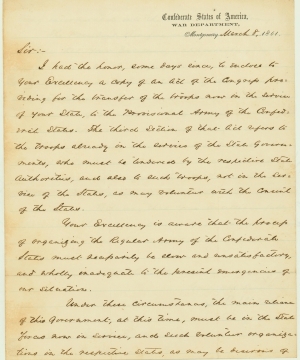 Letter Signed, as Confederate Secretary of War, to Georgia Governor Joseph E. Brown. Montgomery, Ala., March 8, 1861. On “Confederate States of America, War Department” stationery. Docketed, “Call for Southern Rights Meeting.” 2 pp., 9⅞ x 7⅞ in. 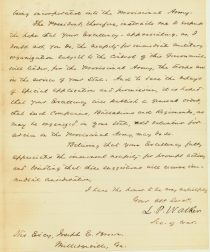 I had the honor, some days since, to enclose to your Excellency a copy of an Act of the Congress providing for the transfer of the troops now in the service of your State, to the Provisional Army of the Confederate States. The third section of that Act refers to the troops already in the service of the State Governments, who must be tendered by the respective State authorities, and also to such troops, not in the service of the States, as may volunteer with the consent of the States. Your Excellency is aware that the process of organizing the Regular Army of the Confederate States must necessarily be slow and unsatisfactory, and wholly inadequate to the present emergencies of our situation. Under these circumstances, the main reliance of this Government, at this time, must be in the State forces now in service, and such volunteer organizations in the respective States, as may be desirous of  being incorporated into the Provisional Army. 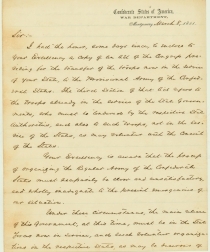 The President, therefore, instructs me to express the hope that Your Excellency appreciating, as, I doubt not, you do, the necessity for immediate military organization subject to the control of this Government - will tender, for the Provisional Army, the troops now in the service of your State. And to save the delays of special application and permission, it is hoped that your Excellency will publish a general order, that such companies, Battalions and Regiments, as may be organized in your state, and volunteer for service in the Provisional Army, may do so. His Ex’cy, Joseph E. Brown, / Milledgeville, Ga. This was part of the first call for troops made by the Confederate government to the states. Except for its vulnerable coastline, no Southern state was in a better position to defend its borders than Georgia. Nevertheless, Governor Brown was reluctant to cede control of Georgia forces to the Confederate government for the common defense of the Southern states. His response to Walker’s request for troops was conditional, and marked the beginning of the long and often bitter conflict between Brown and the Confederate government over its authority over Georgia troops and, more generally, states’ rights. The Provisional Army of the Confederate States (P.A.C.S.) would constitute the fundamental military organization of the Confederacy throughout the war, despite parallel efforts to create a permanent regular peacetime army (Army of the Confederate States of America, or A.C.S.A.). It was intended, once victory and independence was achieved, to eventually disband the P.A.C.S. Leroy P. Walker (1817-1884) was the first Confederate Secretary of War who issued the orders for the firing on Fort Sumter, beginning the Civil War. He was an ineffective secretary, resigning later that year, returning to his native Alabama to practice law. Joseph Brown (1821-1894) was a dynamic, popular governor of Georgia from 1857 to 1865, later serving in the U.S. Senate after the Civil War from 1880 to 1891. Though he was energetic in committing the resources of his state to the war effort, he also engaged in several longstanding public debates with President Davis over such issues as the draft, the appointment of officers to state militia regiments, the suspension of habeas corpus, and the impressments of private goods by Confederate agents. Hill, Louise B. Joseph E. Brown and the Confederacy (Westport, Ct., 1972), pp. 51-54.